It is definitely Spring weather here in Arizona!There is something about spring that makes me just want to live in Kimono's. I usually pair most of my kimonos with high waist shorts or bell bottoms but today i decided to throw on My TopShop striped midi dress under my kimono and i'm completely in love with this pairing! And just in case any of you are wondering, I have not took off my Das boots since i got them last Wednesday. I'm obsessed. Amazing kimono! I love this look! 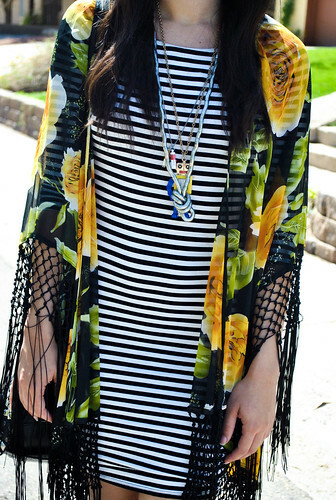 Love that kimono and the florals against the stripes! Hey!!! You show them how to mix prints!! Girl you're the bomb and I mean it!! !